At the end of 2011, I made 10 predictions about the industry for 2012. Since we are now 4 months into the year, I though I’d review the predictions to see how I’m doing. It is also a good way to step back and take a look at the industry as a whole. Read the summary on each prediction here. 1. Modular instruments will outgrow traditional products by 10 points. 2. Asia, and China in particular, will drive big part of modular growth. 3. RF PXI Juggernaut continues. 4. One “big iron” semiconductor test vendor incorporates PXI/AXIe. 5. Modular instruments accelerate transformation of semiconductor characterization market. 6. Three more companies join AXIe. 7. Big Physics embraces AXIe. 8. PXI software standards bring new levels of compatibility. 9. One large VXI to PXI/AXIe conversion. 10. More evidence of the coming disruption of modular instruments. Modular instrumentation has seen steady development, outgrowing the traditional box instrumentation over the past decade and the test and measurement market as a whole. Nevertheless, the traditional instrument market remains about 10 times the size of the open-system modular market, largely defined by PXI, VXI, and the emerging AXIe standard. This is about to change dramatically, due to a number of factors. Powerful forces are igniting a disruptive change in the marketplace where open modular systems will become the dominant architecture for automated test solutions. In this in-depth industry analysis I use work from great economists, John Forbes Nash and Michael Porter, to analyze the changes occurring in the test and measurement battlefield. Customer, suppliers, competitors are all analyzed. My conclusion: A disruptive shift is occurring in the test and measurement industry over the next few years shifting automated test systems heavily towards modular instruments. What’s up with proprietary modular systems? In my recent article Integrating Traditional and Modular Instruments, I drew a contrast between traditional box instruments and open modular platforms, such as PXI, VXI, or AXIe. I briefly mentioned a class of products that are proprietary modular designs. These are modular instrument systems from a single vendor that consist of that vendor’s plug-in modules. Applications range from electronic switching to logic analyzers. So, what are the trade-offs between proprietary and open modular systems? Let’s look at the reasons users are attracted to modular systems to begin with: size, speed, flexibility, and cost of test. You can find my analysis in my new blog post here. We’ve all heard the saying, “Time is money”. The saying was made famous by Benjamin Franklin, who was later honored by his place on the 100 dollar bill. This saying is particularly true when it comes to test. Test impacts an electronic manufacturer financially in two very different ways: time to market and test time. First one is measured in months, and second is measured in seconds. In my latest Outside the Box blog I take a look at both, and predict what this means for the future of box and modular instrumentation. Two weeks ago I published an article that covered many of the basics of integrating traditional “box” instruments with modular instrumentation. Whoa! Boxes and modules together? You mean you don’t have to choose one platform and keep to it faithfully, publicly scolding those who choose differently? Why is there such polarization between supporters of modular and traditional instrumentation? Answering that brings me to the history of mods and rockers. 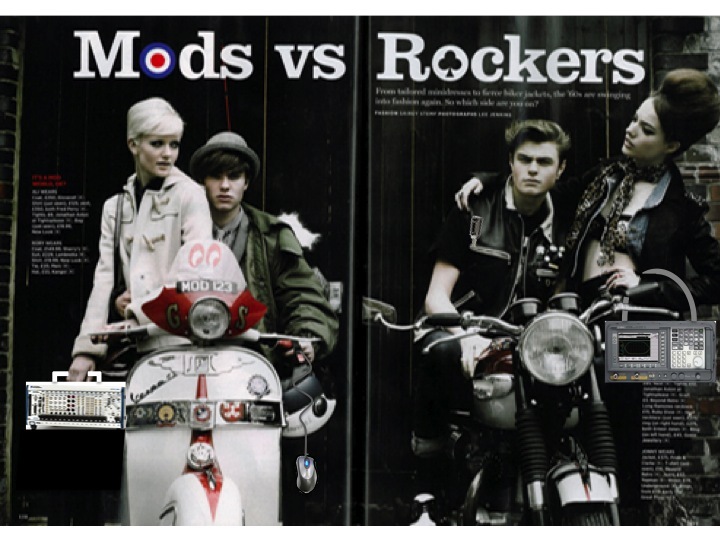 To read a light-hearted history of mods vs. rockers, and modular vs. boxes, click my latest blog here. The photo is worth it alone. What does Agilent’s New PXI Signal Analyzer Signal? Let’s Analyze. This week Agilent unveiled a new PXI signal analyzer that boasts some very impressive specifications. Officially dubbed a Wideband MIMO PXI Vector Signal Analyzer, the new VSA brings to market capabilities not previously available in any form factor, box or modular. I’ll take a look at the product, and what this may signal about Agilent’s strategy. So, if you want a glimpse of what Agilent is thinking, how that compares to others, and what this means to the industry, then you need to analyze this.